I painted Laksmi in 1996 for the Goddess Oracle.. Ancient India did not erect temples to this goddess, for why try to contain the one who embodies herself in all forms of wealth? Lakshmi is everywhere: in jewels, in coins, in rare shells, in every child born to welcoming parents, and particularly in cows. The well-known reverence for cows in Hindu India is based on the worship of this goddess, called the Shakti of life-preserving Vishnu. Hindu philosophy defined male godhead as passive and abstract, distant and powerless, unless activated by the goddess. In Vishnu's case, his power to maintain and enrich life only functions when Lakshmi inspires it. Therefore it is thought good policy to bestow reverence on those embodiments of wealth-the cows who in some parts of India are simply called "lakshmi" after their owner. Some myths say that Lakshmi existed from all time, floating before creation on a lotus; for this she is called Padma ("lotus-goddess"), whose symbol became the sign for spiritual enlightenment throughout Asia. Some stories say that Lakshmi sprang up from the ocean when it was churned by the gods, emerging like a jewel in all her beauty and power, covered with necklaces and pearls, crowned and braceleted, her body fat and golden. 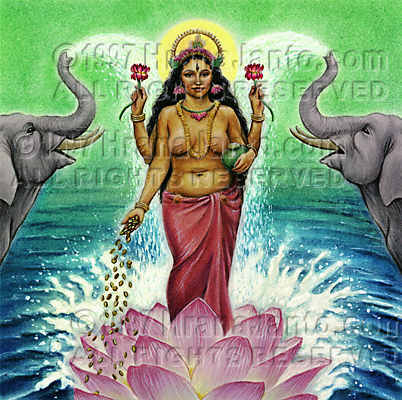 Many interpreters see the variant legends as recording Lakshmi's preeminence in pre-Aryan India, where she was goddess of the earth and its fructifying moisture, and her later incorporation into Vedic theology when her worshipers would not abandon their devotion to the lotus goddess. Once established in the religious amalgam called Hinduism, Lakshmi grew to symbolize not only the wealth of the earth but of the soul as well, becoming a magnificent symbol of the delights of spiritual prosperity.